The Finno-Ugric people are the original inhabitants of the European and Eurasian north that belong to a separate "Uralic Family" linguistic group. The Finno-Ugric substratum is present over a wide area within and outside Russia, from Norway to the Urals and down to the Black Sea. In these pages, the term "race" is not used to describe groups of people because it is merely a construct and does not exist in reality. There is no race of Finns, Russians, or even Englishmen. Besides, the term is not useful in most cases because everyone living today is of more or less mixed genetic content. The idea of a "master race" or "superior race" has been thoroughly disproved. Racism is a term derived from the concept of "race." But it is really just hatred and violence against anyone different from oneself or of what they consider a lower grade stock, by someone who imagines belonging to some elite or higher group as for example royalty. Race theory presupposes that at one time there existed separate races, which in time started to mix, and there is no proof of that - quite the opposite. According to anthropologists we all came from Africa. Further, the total spectrum of humans, whether traits be based on color or any other criteria, is impossible to separate into categories. What will be the catergories? Who will decide? A person would end up in different groups depending on what criteria was used. Attempts to broaden the concept of race to "white", "black", "yellow", "brown" or whatever is filled with similar problems. What shades are "white" and could you have siblings belonging to different "races?" Therefore categories of "race" really have no place in good science at all, in the opinion of the writer. It is a concept which blurrs science. Besides, the main difference between all people for our purposes is cultural and linguistic, and the rest are subjects for feature character analyses of people. These can be categorized statistically, but cannot be sorted into "races" as such. Newcommers filtered in to Finland over millennia and were absorbed by other arctic, possibly related people. The writer does not believe that the Finnish people "arrived" there from somewhere else, filling a vaccum. They had already been moving East and West for millennia on their ancient water-ways. The choice to settle in any area, including the present day Karelia and Finland was made for various reasons relating to survival in the north. The Finland we are talking about is not the present political boundary area, for their wilderness trips covered a much wider area and involved trade through various middle-men. The term Finn shall refer to Finnic people, covering the area between Norway and the Volga and North to the White Sea. Immigrants to these northern wilderness hunting, trapping and fishing grounds were from many different places, but over time they mixed and created the Finnish people. From this perspective, Finnish, like Saami, is an indigenous language of the north independent of genetics. Mari People Under Attack by Russians 2005 - Sign protest sheet. As the ice retreated about 10,000 years ago, stone-age men, perhaps early Finns, occupied the rich new lands between Norway and the Urals. They were followed by other wanderers in the North, many of which were Germanic. According to Matti Klinge, (University of Helsinki), the dominant "genetic element" in Finland today is Germanic. Perhaps Germanic people had also followed game northward since the dawn of history and were accepted there amongst the Finns. When the waves of disease swept over Europe, it is possible that the germanic genetic traits (ie. the ones carrying specific immune factors, such as blood type A), survived because the immune factors were already there and did not have to be produced by the human immune response. In this way, beneficial traits were gradually imported along with technology to the North from Europe. The eastern Finnic nations mixed with wanderers from the south and east and therefore they differ genetically from the western Finns. This genetic variability was beneficial to the eastern Finns as well. Biological diversity is what helps species to survive, and this applied to the Finns as well. Naturally, in different geographical areas gene pools differ due to "genetic drift," which is a very well understood phenomenon. The Volga Finnic people are referred to as Finns here even though they differ significantly in many ways, especially in the language which is mostly conversationally unintelligible to Baltic Finns. Mari Kusle, "Kantele" in Finnish - traditional musical instrument. 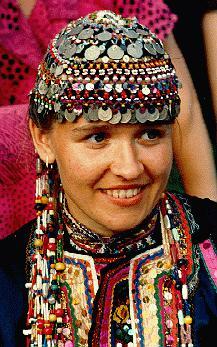 The Mari people are a middle Volga ancient Finno-Ugric nation. The Mari's divergence from the rest of the western Finno-Ugric speakers began about 3000 years ago. By 500 AD, the Mari nation had become established from the ancient Mari inhabitants of the Volga and also from the newly arrived Iranian cattle herding tribes. The meadow and mountain Maris differentiated from the original volga residents by 1000 AD. The name Cheremis (Sarmys) was probably a Turkish related Tšuvas name for the Mari, which was then adopted by the Turkish-Mongolian related Tatars, and Slavs. The Slavs propagated the term Cheremis, which others adopted as well. The word Mari, by which the Mari call themselves, may be derived from the Iranian neighbours. Apparently, the Mari used to live further west, where the Oka flows into the Volga. Historical accounts, place names and folk tales confirm this. The Mari have been closely associated with the Tšuvas people from ancient times, as evidenced by the numerous loan words which are in all the Mari dialects. The Bulgars, who were the forefathers of the Tšuvas, settled in the middle Volga area in the 700's. The Mari were incorporated into the Bulgar's economic and administrative influence. Then, when the Mongolian-Tatars invaded the Bulgar state in 1230 AD, the Bulgars moved north up the Volga into the Mari territory and settled there. After that there came the golden horde that took over Kazan, and their rule, and finally the Russian rule starting in the 1500's. In 1989 the population of Maris was 670 000 persons, of which 80.8 % claimed the Mari language as their mother tongue. About half (324 000) of the Mari people live in Mari El in the bend of the Volga River. There are Maris also living in Bashkir (106 000) Kirov province (60 000), Sverdlovsk, Perm (30 000), Tataria, Udmurtia, and so on. Based on cultural differences, the Mari are divided into three groups: Mountain, Meadow and Eastern Mari. Linguistically Meadow and Eastern Maris together form the Eastern Mari dialect and Mountain Mari is called the Western Mari dialect, which includes the dialects of Mari residing in Vetluga River regions. The relative composition of Mari people are: Mountain Mari 10%, Meadow Mari, 60% and Eastern Mari 30%. 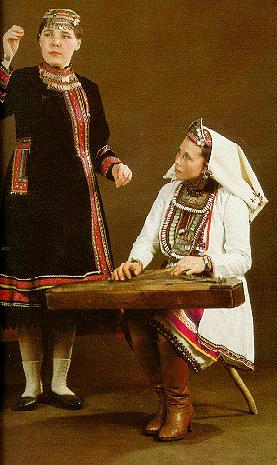 They have their own literary language, but most use the Eastern Mari literary language (85-90%), namely the native speakers in Mari El Republic's East half, those residing on the North shore of the Volga (Meadow Mari), those in Baškortostan and Tatarstan, Udmurtia, Perm and Sverdlovsk provinces. The Western Mari dialect is spoken by 10-15% of Mari people ie. those on the South bank of the Volga and some Mari in Nishni-Novgorod and Kirov provinces. The closer contacts between the Mari and Slavs began in the beginning of the 1400's. At this time, the Mari joined with the Tatars against the encroaching Slavs. However some Mari joined the Russian forces. The Mari who lived on the south side of the Volga sent representatives to Moscow, and explained that they would like to join the the Slavs against the Tatar rule. But the Meadow Mari on the north bank remained united with the Tatars. This split the Mari in two, and in 1553, Moscow's armies under Ivan The Terrible conquered Kazan. The Mari continued their fight against the invading Russians under their own leadership. These merciless wars were known as the Cheremisian Wars, which lasted from 1553-1580, and resulted in the extermination of one-half of the Mari nation. Malmy was the last stronghold of the Mari. This was distroyed in 1556. The Mari holiday held on April 26 remembers the fallen heros of this war and honors their great leader Poldšin. The 1500's also marked the beginning of the Orthodox Church's forced conversion of the Mari people. Those who did not accept the new religion were persecuted and taxed heavily. Most of the Mari people chose to flee East to excape the new government. Over the next several hundred years, they became known as Eastern Mari people, and this group, which numbers around 200,000, still constitutes the major part of the Maris that live outside the Mari Republic. During the Tatar rule, the Cheremises were divided into three classes: those who paid taxes, tax-free army reserves, land-owners and leaders. During the Russian rule, these divisions were preserved in the beginning. But towards the end of the 1700's, to own land, you had to be baptized. The tax-free status of the army reserves was ended in 1718 and they were combined in with the peasant classes who were now expected to serve in the army. The Mountain Cheremises ended up as serfs. During the 1700's during the Elizabethan era many Mari people converted to the Orthodox faith, after which they were released from their tax burden. But the old nature-worship still survived beside the new religion, however, their taxes were huge. Russification with the help of the general school system began in the early 1800's but they were unsuccessful. These efforts were renewed in the 1900's and the results are most evident in the Western Mari. The year 1775 was an important year. This year saw the beginnings of Mari literature; it was the beginning of teaching the Mari language. It was tied to the Cyrillic alphabet. The New Testament was translated in simplified form into the Western Mari language in 1821. During the 1800s the Orthodox Church ran the schools, where the Mari language was taught as well. The Mountain Mari school readers appeared in the year 1867, Meadow Mari school readers came out in 1870. Four books of the Bible were translated into Mari in 1906. By the September Revolution, there were already 225 books written in the Mari language. Most of them were for use by the Church and its schools. 1905 was the birth of Mari literature. That year a Mari poem appeared in the Mari language written by Sergei Šavain called "Oto"(leaf tree forest). The first secular works, the Marla Kalendar (Mari Yearbook) appeared between 1907-13. These literary works were the beginnings of Mari literature. The Biblical translations were the model for correct grammar. After the 1917 revolution Maris began developing a proper grammar in its full meaning with renewed energy. The Mari Autonomous Republic was established in 1920. Mari and Russian languages were declared "official" languages in 1923. Officials had to know both languages, and education was in both languages all the way to high school. The 1920s was the golden age of Mari culture. In 1936 the Mari Autonomic Socialist Republic was established. The development begun earlier did not continue far. In 1937 the educated class of Mari El was almost totally destroyed by Stalin's decree. A mass grave of 200 Mari writers was found in a swamp near Joskar-Ola, and on Stalin's orders, the educated class was desimated: artists, skilled workers, doctors, and teachers, together about 4000 - in other words the cream of Mari El. The murdered people of 1937 were reburied in a communal grave near Joskar-Ola in 1990. The bodies were recovered from their mass graves with all the bodies in disarray with vodka bottles and other liquor bottles. Every skull had a bullet hole. Dispite the terrible fate of the Mari people at the hands of the Communists, the Mari culture could not be destroyed. Fortunately Mari literature made a comeback after WW2. The period after Stalin's death (1953) was called Krushchev's Protective Era. In 1960 Mari literature was reborn. Valentin Kolumb (1935-1974) was the best known writer of this period. Kolumb dealt with the Mari condition in a time when the subject was not appreciated by the Communist government. In a short time Kolumb wrote ten books which have been translated into other languages, but not into Finnish. The themes are current events, but the poems contain a lot of thoughful and timeless philosophical themes. Kolumb is the renewer of Mari poetry (meter); as the first Mari lyricist he used a free (vapaata riimillistä mittaa in Finnish) verse. Kolumb also translated some Kalevala runes as well as Shakespeare, Goethe, Petöf and other world classics. In 1963 Erik Sapajev wrote the first Mari opera "Akpatyr" based on the text by Sergej Tšavain. Akpatyr tells of the wars between the Mari and Tatars. The main character Akpatyr is based on a Mari mythological character. But, at the same time Khrushchev's educational renewal policies were a disaster to the Mari educational system. The schools were Russified en masse except for country schools grades 1-3 (1-4). In villages with a majority of Russian speakers, the lower grades too were soon taught in Russian. This was called the period of stagnation. It was a time when youth felt that being a Mari was not an asset and many were ashamed of their nationality. Many young Mari wished that their passports were stamped "Russian." In literature, those who bent to the will of the Communist Regime, produced "Mari Realism" - superficiality in which the harsh life in the Communist state was smoothed out and repressed. Today Mari El is not a much bigger piece of the Volga shore than Mikkeli province in Finland. Its area is 23 300 km2. Mariland is a part of the Russian Federation. The population in 1993 was 760 000. The breakdown was as follows: Mari 43% and Russians 47%, Tatars 6%, Tšuvash 1,3% etc. Mariland has altogether 50 nationalities. Opportunities to develop their own language culture have improved for the Mari's as well as their brethren Finno-Ugric peoples. This is partly due to the fact that in their name-sake Republic, there is a 43% Mari population and even in the nearby Bashkortostan the Mari culture has survived comparatively well. This compares with the lower Mordovia 34%, Udmurtia 31%, and Syrians in Komi only 25%. The capital city of Mari El is Joškar-Ola and it means "red city." Joškar has another meaning in the Mari language, "beautiful." The capital city has 300 000 inhabitants of which only a quarter (23%) is ethnic Mari, which is not a lot relative to the Republic's population. On 22 October 1990 Mari Autonomous Soviet Socialist Republic became a part of the Russian Federation. Since 1992 the country is officially a Republic named Mari El. "Mariland" or in Finnish, "Marinmaa," has its own parliament, national flag, crest and anthem. Mari El is represented in the upper house (in Finnish korkeimmassa neuvostossa) of the Russian parliament. In December 1991, the Republic of Mari El got its first president. The first president was a mountain Mari Vladislav Zotin. The Mari started to demand language and cultural rights similar to other minorities in Russia. The increased freedom of speech which was present after 1985 did not immediately have any impact on the literary output of the little nation. Stereotypical thought and decades of brainwashing regarding cultural history and identity were still alive and well. The first literary works that showed any new ideology began to appear in the late 1980s when the Stalin era archives were opened. The new Mari literature is completely new and original and modernizing in style. They deal with the terrible fate of the intelligencia during the 1930s, the stagnation period and contemporary problems. In April of 1990 the Mari Society (Marij ušem) was established. Almost every area where there are Mari, you will find a chapter. In April of 1992 the democratic society of Marij ušem held its second congress. At this time the basically social/cultural organization became a political party and a Mari nation leadership meeting was called. The meeting was held 30-31 October 1992. But now the second president is Russian (Vjatšeslav Kislicyn) who does not understand Mari, and the ministerial portfolios too have changed. The country has about 20 political parties. Communists have continuing strong support. 2 The presidential elections only strengthened the Communist party. The classroom is usually represented by many nationalities. The common language is Russian, the language of the majority. In the Fall of 1994 a new educational system appeared in Mari El, which promised to increase the Mari culture in the schools. According to the new system, in the lower grades, (grades 1-4) education would be in the Mari language. Mari language, literature, history and culture would be offered in most Middle Schools ( grades 5-11), Trade Schools, Technical Schools, and High Schools. The problem is, there is so little written material in the Mari language, and what exists is mostly out of date. Since the 1993 Finnish Parliament's approval of support for Finno-Ugric development, there has been an increase in the development of teaching aids. According to official sources, there were 256 schools in Mari El in 1989, where Mari language courses were taught, or was the language of instruction. In 1994 there were 354. Despite this, Mari language and culture are still being taught as a "foreign language and culture," only part-time and only about 1-4 hours per week. So in the Mari National Library is located in Joškar-Ola and it is named after the great writer Sergej Tšavajn, who is like the counterpart of Alexis Kivi, the great Finnish writer. The library was established in 1920. Most of the books are printed in Mari El and concern the Mari people, the Mari nation, its living conditions, nature, culture and history. Only 10% of the books are in the Mari language. There are also foreign literature. According to the Mari cultural sociologist (Marilaisen kansantieteilijä) Timofej Jevsejev (1887-1937) his namesake National Museum was founded in 1920. The National Museum has three sections: describing Mari nature, culture and Mari tradition. The museum also displays articles made by Mari living outside the Mari El Republic. In 1986 the museum had an exposition of Finnish culture by IIdiko Lehtinen and sponsored by Finn-Stor. The Mari National theater in Joškar-Ola, Sketan Theatre, was established in 1919. It puts on programming 3-4 times per week in the Mari language. There is something new every month - seven different Mari presentations per year plus some translations. The director of the National Theatre is Vasili Pektejev who has visited Finland many times as a director and actor, representing Mari Usem, and taking part in the Tampere Summer Theatre program. The youth theatre, Samyryk Teatr (Nuorisooteatteri) is called Irkabajev's Theatre, for its director. The director, Oleg Irkabajev, is trying to renew the Mari Theatre's fame - with Mari historical as well as modernistic presentations. It works out of its cramped Joškar-Ola doll theatre as a room theatre. Irkabajev's theatre has received the approval of the open-minded, educated Mari youth. Joškar-Ola's doll theatre, which is a relatively modern building, puts on doll shows in Mari and Russian. In the Fall of 1992, Joškar-Ola doll theatre put on a show during Finland's 75th anniversary celebrations, in the Mari language and Russian "Alvar and Shadow" which was arranged by Miklai Rybakov and the Finnish director Nena Stenius. The Mountain Mari's capital of Tsykmaan (Kosmodemyansk) has a new West Mari dialect theatre as well. Joškar-Ola also has opera and ballet, but in the Russian language. There are many publications in the Mari language, but with small distribution. Still they have an important meaning to Mari language, Mari literature, native culture and the national identity. The publications are read by Mari living outside the Republic as well. All the Mari publications suffer from shortages of paper. There are just too few computers, or they do not exist at all. The largest Mari language newspaper "Mari El." A very popular paper is the illustrated humor publication called Patšemys. The Meadow Mari cultural publication Ontsko (Forward) is about Mari literature and translations from froreign languages. The comparable Mountain Mari publication is U sem (Uusi sävel in Finnish) or New Tune. Of the children's publications, Ketše (Aurinko) "Sun" is the most popular. A somewhat less popular one that appears in both Mari dialects is the children's publication Jamde li in Eastern Mari, Jämde li in Western Mari, or Be Prepared. Kugarnja (Friday) is directed at 15 - 35 age group, which tries to emulate the free style of Western publications. Kugarnja is noticeably freer and more democratic than Mari El. The Mari publication distribution is as follows: Patšemyš, Mari El, Ontšyko, Kugarnja, Ketše, Jamde li, U sem, Jämde li TV and radio Mari language programs. The majority of television and radio is in the Russian language. Every day Mari television has 2-3 hours of programs where half is in Mari and the other half in Russian. Joškar-Ola radio has 18.5 hours of programs which is split 50-50 between Mari and Russian. Included in the Mari programming is also some Western Mari dialect programs. The Mountain Mari, in Tsykma (Kosmodemyansk) have their own radio station. 1 Russian financial management is at third world level. 2 The Estonian Institute says Communists cannot ensure the survival of Finno/Ugric people. 3 Communism destroys native cultures: the state takes over education of children. It happened with the native people of Canada and the United States. 4 Why not help the Mari develop Mari culture. Aid to Russia does not get to minorities. 5 This is typical of Russians, who resist learning the language of whatever country they make their home in, such as Karelia, Estonia, Latvia and Lithuania; Mari El. 6 Notwithstanding the fact that such a large percent of Russian speakers live in Mari El, this should not be too great a problem if the children in the countryside continue to get a Mari education, and the numbers of Mari schools increase in the cities. The same happened in Finland with the Swedes when they outnumbered the Finns in the cities. This changed when the Finns began moving into the cities. Perhaps founding a Mari Language University in Mari El would encourage Mari from outside the Republic to move there and change the demographics in favor of the ethnic Mari. Latinization would also help anchor the Mari Republic to its cousins in Europe, namely Finland and Estonia. It would help to preserve the Mari culture and language by reducing the influence of Russian, which should be, and rightly so, a secondary language in the Mari Republic. Mari scholars could convert the existing texts and manuscripts in a reasonable length of time. And while they are at it, they could translate other languages to print. Finland may even be willing to finance such a project if the Mari themselves request it. Finnish could become a model for words previously borrowed from Russian. This may sound like a far-fetched idea but it could be doable. Maps- Uralic Family Home Page map collection - Ancient place names: It should be underscored here that the scholars of prehistory and history regard ancient place-names of a country as proof of the identity of the language in which it occurs and that of their speakers who gave them to the places which they occupied and inhabited for a considerable length of time. Komi hunting ethics - How Komi tradition defines hunting rights. What happens to trespassers. Where do - Finns come from? Komi Zyrian Language - Andrey A. Pomysov's site. Vaslin lyshtashyzhe http://www.ut.ee/~vasli Information on Mari history, mostly in Finnish. Antti Hänninen Eastern Karelia, Lake Onega. Short history of the Finno-Ugric people From ice age to Varangians and Rus. FU Stats. Finno-Ugric Core Values - Finland and Estonia. Blood Types Comparison of blood types of various populations. Kerala: 100% literate Dravidian people of the Indian subcontinent. Linguistic ties to Finns.